a group of friends across social networks (did one for all those in Ojai). A few of the networks available are Twitter, Digg, Flickr, Friendfeed, LinkedIn, and a few others. I suspect the goal is to have this grow. Since I use many of these services, it seemed like a no-brainer to give it a try. With that said, because it is an alpha product and for the heavy social web user it isn’t super easy to jump in and use. I’m certain elements will be improved and changed, as I’ve noticed in the last week, but right now it isn’t my primary client for Twitter. As you use the tools main navigation to select a stream/feed for one of the networks, the entire interface will change colors to that particular networks colors. Nice touch. When on Twitter it is blue. When on seesmic, it is black. Helps to orientate the user in a very busy environment. Sending a Tweet is pretty simple, big block right at the top of the screen, which also allows you to save a draft copy of your tweet (not sure why you’d need a draft of a 140 character post, but there it is). What do I love about PeopleBrowsr today? If I move away from the window and then return, it starts to load my feed from where I left off and streams past so I can read it. Gallery View. Great option for the visually minded. Overall, I like PeopleBrowsr and I will keep using it, but it can seem a bit overwhelming initially. The developers are very responsive and are open to suggestions (the best part about working with an alpha product). What this one as it develops, play with it (and keep Tweetdeck running in the background). If you’re using PeopleBrowsr, tell me what you think. 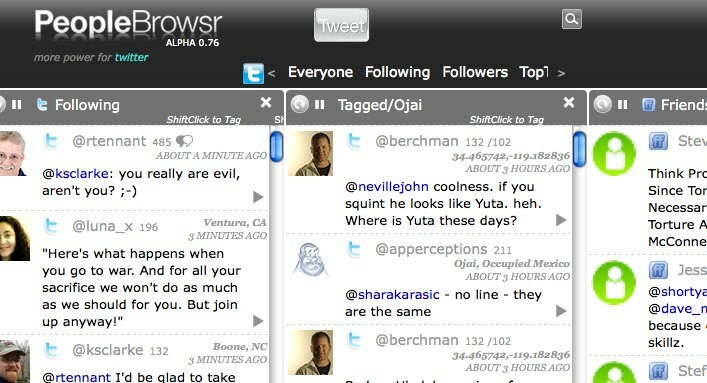 If you haven’t tried it yet, it is as simple as going to peoplebrowsr.com and entering your Twitter account. Thanks Kenley for this great review. I love that you mentioned the settings memory and the grouping. Thanks for your help with the grouping feature: having your screencast as feedback was really helpful. We opened our Alpha to improve the product with real help from the Twitterverse and we are delighted that we did this. You and the other users are really fine tuning PeopleBrowsr. We use 'Live' tweets and messages from our Google Group http://groups.google.com/group/peoplebrowsralph… to shape PeopleBrowsr in real time. Our development team is located in the US, Australia and Germany, working in different time zones to be responsive to feedback. Social networking is becoming 'social developing': we are amazed by the quality of the comments and the engagement of all our users. 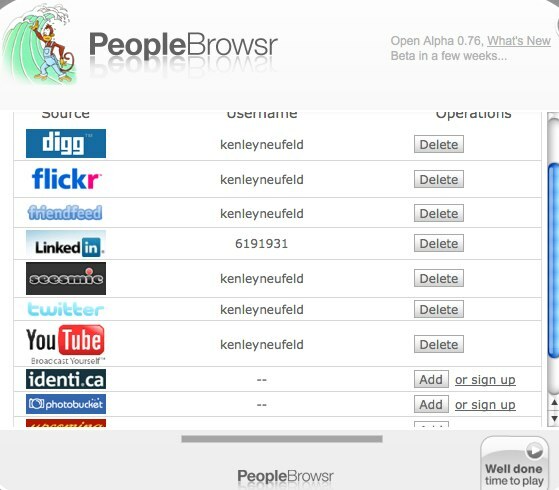 Kenley: I came across your blog post about PeopleBrowsr as I did a search. Since this still comes up in searches about PB, thought I would update you on more good news about it. (I'm a PB Coach, named Lori Gama: http://twitter.com/lorigama). *Marketers: A sentiment tool. Track your brand, buzz, customers and stats. Export ready-to-print reports. A super powerful multi network dashboard. Now in Lite, Advanced and Business mode. A platform that helps businesses reach and engage customers using Twitter. Become-a-news-editor. Browse trending topics and share. The ultimate Conference visualizer with streaming tweets and word cloud. As Priscilla Scala, Peoplebrowsr Product Manager, mentioned in her comment: Peoplebrowsr community is very helpful in giving feedback and suggestions. The PB developers are very responsive to the feedback/suggestions. I think it's the greatest thing invented since Twitter. You might consider doing a follow up blog post because there are so many new things.